I love flank steak. There I’ve said it. Again. Maybe for some it wouldn’t seem a match for that magnificent rib eye I recently had but I just love how the ‘need’ to marinate it also means that the flavor can be so manipulated (in a good way) by the cook depending on your tastes. Want to serve it from the grill American style? This version is terrific. Mexican? Add some heat to that same version and you’re good to go. Want something really impressive for guests? Use a flank steak for this Bisteca ala Panzano’s, layered with pesto and mashed potatoes which is just amazing. I know there are proponents of a more Asian flair which is not my typical bent but when I saw a recipe and it was one of those moments I had of knowing I had to…oranges in the colander and flank steak in the fridge and I was ready. But then life got in the way and several days later, the oranges are gone except the one that has seen better days but my hankering was not. What to do? How about grapefruit instead of orange juice? Really, why not? I went a bit off course with olive oil and garlic and a bit of honey to offset the more tart grapefruit. The result? Mad Love. The acidity of the grapefruit and the overnight marinating made this piece of meat so tender and the combination of ingredients were subtle but amazing. I do think I could mix almost any variety of spices, add some olive oil and garlic, sometimes wine and a vinegar or juice for a bit of acid and be happy. Meat marinades really allow our own creativity to reign so go for it. They serve as both a flavor enhancer and a tenderizer and are perfect for cuts like flank or skirt steak that would be tough without some help. This is just a start…I would love to hear what your favorite marinade combination is; leave a link in your comments if you have a favorite recipe! 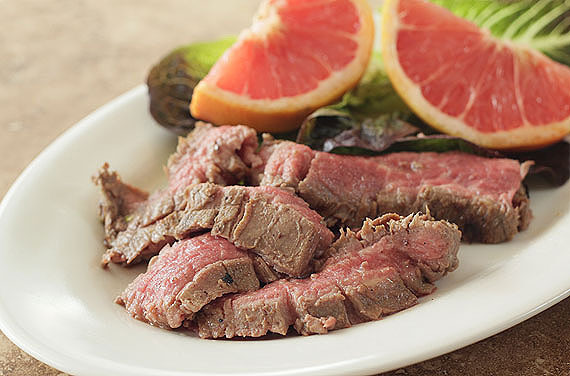 An Asian influenced citrus marinade for grilled flank steak. Lightly score flank steak both horizontally and vertically on both sides. Add meat to marinade and make sure both sides have been covered in marinade. Refrigerate 4 hours or overnight. Grill meat for 5 minutes per side. Flank steak is not meant to be cooked until well done; doing so will see it become dry and tough so I recommend medium rare as the best choice but no more than medium for best results. Cuts like flank steak require that you slice against the grain; holding your knife at an angle to produce nice slices of meat. Here's a great simple video of this procedure. « Happy Easter, Happy Spring! I just spontaneously decided to try using grapefruit juice to marinate a steak and veggie combo dinner I cooked and it turned out excellent, so I thought I’d look to see if anyone else had anything to add and I think you have some great ideas I will try to refine the dish. Bravo on the marinade! I honestly have never thought to use grapefruit. But you’reright – why not?! I love grapefruit and I have an unhealthy obsession with beef. 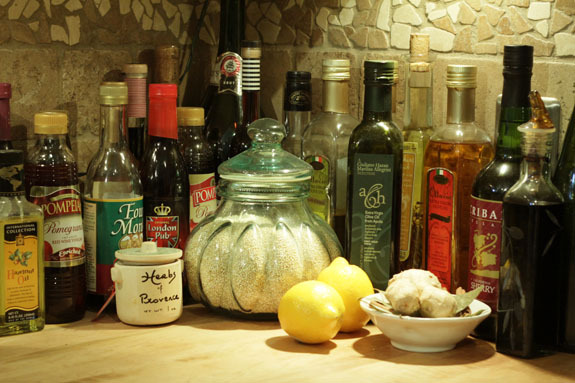 My marinades usually contain a whole bulb of crushed garlic. I need to step outside the bulb!! It was SO tender I actually had to be very careful when slicing it. I bet the grapefruit juice creates a very tender steak. If only I ate meat, I’d be all over this recipe. I know you would…love your support in any event my friend. Oddly enough, I’ve never thought of adding grapefruit to meats but this seems like it would be delicious! Thanks for sharing! I never had either; the acidity REALLY tenderizes and the seasonings married beautifully with the meat. I am a fan of flank steak, as well… This looks great… I love how the flavors sound! This does sound delicious to me as grapefruit is one of my “new” favorite flavors. For most of my life I haven’t cared much for it and then one day it just clicked. I have a favorite fall back marinade. It is from one of my Southern Living cookbooks and I have to tweak it a time or two but it always comes out great. Try adding some Hoisan, Mirin, 5 Spice powder, Sweet Chili sauce, and maybe even a fewe Tbs. of regular BBQ sauce–any or all can be a flavor enhancer when marinating flank steak, or try it on tri-tip steak…I love asian style marinades. Great idea…love 5 spice powder and need to use it more. Thanks Sharon! You are as adventurous in the kitchen as you are talented! Kimmy…my hero. I fear if together we would be awash in bourbon and wine 24/7…wait, would that be bad? Another great idea! I also never use a recipe when I make a marinade. I just grab my oils, soy sauces and vinegars and mix and taste, mix and taste. Guess the next time I grab a flank steak, I’m gonna have to add some grapefruit juice and honey. I don’t use a recipe either…which makes it hard when I’m doing a blog post cause then I have to remember what I put in. I keep threatening (or promising myself maybe) that I’m going to get a headset tape recording device so I can dictate what I’m doing while I’m doing it! It’s all your fault and I’m so grateful. You must try grapefruit too. Next for me…I’m already thinking of a combination citrus/hot pepper something. What I want to know is if your counter of oils is always that meticulous?! I love opening up the fridge and pantry and seeing what will combine to make a marinade. Mine typical involves a drop of sesame oil. I’m love the scent and flavor it gives and never more than a drop or two is needed. Um, maybe? Hope you’ll forgive me…can I bribe you if I say I also love sesame oil?